I have been missing in action this week. No journaling, no art, no going into the dining room and creating. However I have been creative. 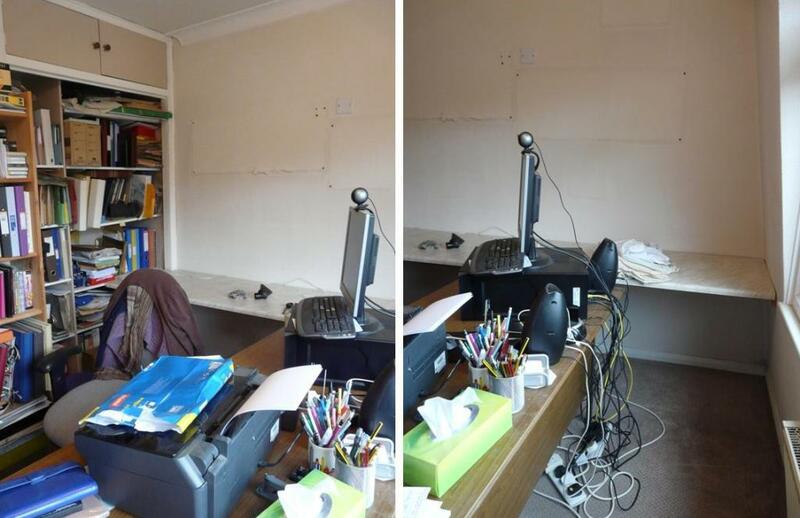 I spent some time over each of 4 days tidying an area of our home office. I then decided it was so tidy that I should decorate the room. That's an exaggeration - I would paint the ceiling and the walls. Wash and iron the curtains. And maybe wash the paintwork. So I untidied the room again. I painted matt Almond White emulsion over silk Almond White emulsion on the ceiling and walls. Not a very good idea. 2. Putting the same colour on top of the previous colour means you can't tell where you've painted until it's dried and then you can see all the places you've missed!!! Which is when the room looked like a coffee and cream dalmation! I did go back to these patches on the wall on Wednesday. So much to my disgust, this morning I spent repainting the ceiling and the sloping wall to the left of the window. The weather had warmed up somewhat so the paint was drying rather quickly which meant yet again it was blotchy. However the ceiling has dried and there are no blotches. Hooray! We've put the furniture back except for the bookshelves which probably won't go back up until Monday. And I am really thrilled with this clean and tidy room. We do still have these 2 bookcases to sort out but we can do that a shelf at a time. I think I might go back to some art journaling and travel journal making before I tackle this lot. Congratulations on what you accomplished - doesn't it feel good? And I bet those other piles can be done quickly (now that you've got the hang of everything). I've done that with the paint too - so annoying! I have also been doing the moving things so that you can move something else to tidy up routine as I swap DD's bedroom with the craft room. My dad described it as spending 2 hours clearing to do a half hour job! At least yours is all in your spare room - my bedroom looked a bit like that last night when I wanted to go to bed! I do a lot of that shifting when I am trying to clean/organize an area or room and since I have the spare room as my craftroom, either I load another surface to be cleaned off later or my bed which will need cleaned off before I can go to bed. You have done a lot though and I wish I was that far along with my room.